The Story of Schaefermade - Schaefer Advertising Co.
By now, any of you who were curious about all of our Schaefermade Facebook posts from a couple months ago (not to mention the bright yellow building next to our office) might have thought we would never tell the story of Schaefermade. Sorry about that. We got busy, and, well, you know how it is. So what was the deal with all that? Well, twice a year, Fort Worth holds an event called Arts Goggle during which artists display their work in local businesses. It’s a city-wide event, but most of the fun goes on near our office on Magnolia. Each year for the Spring Arts Goggle, we try to think of a way to participate and engage the crowds who flock to our neighborhood. Our goal is to find a way to differentiate our booth from the businesses, artists and vendors at the Near Southside Arts Goggle event while building awareness for Schaefer Advertising Co. in the community. 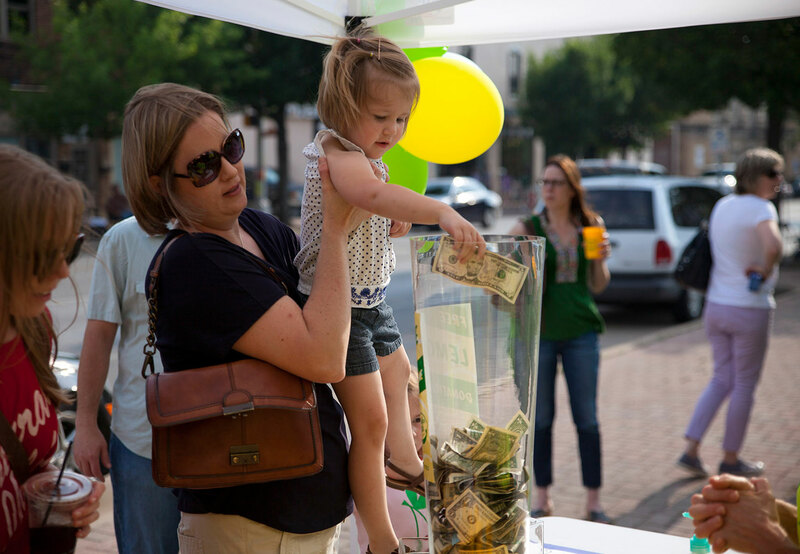 This year, we decided (with the help of former interns Darcie Nicholson and Elizabeth Kahn) to do an over-the-top version of the classic summertime lemonade stand. We’d create a pop-up lemonade stand for the day of the event, then use our advertising and PR skillz to get the word out. 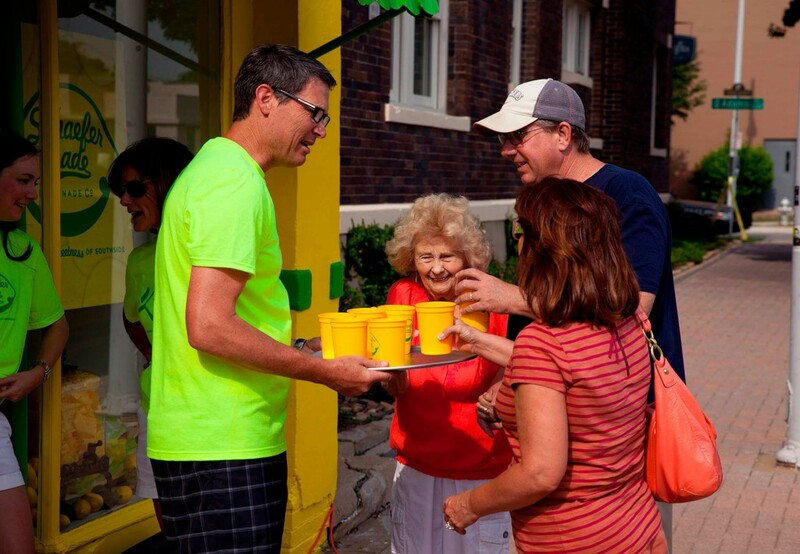 The lemonade would be free, and all donations would go to Fort Worth Southside’s tree planting initiative. With this theme in mind, we kind of went nuts. Donkeys have their carrot. 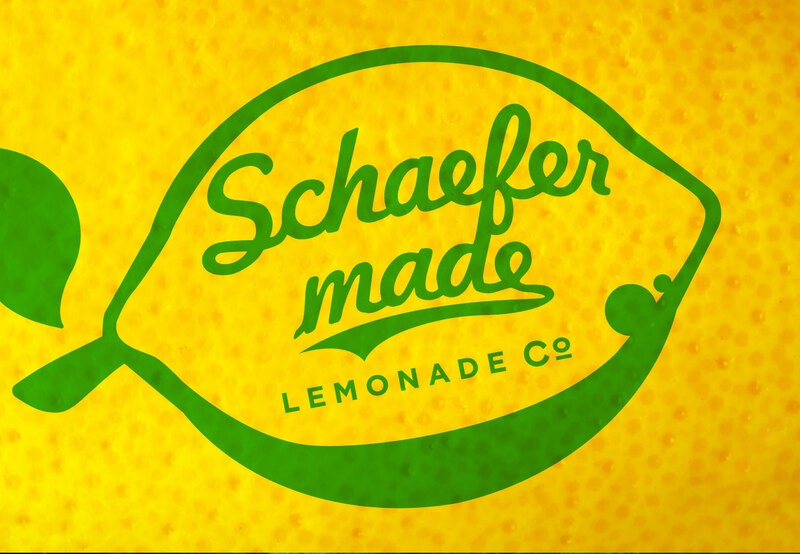 Schaeferites have their lemon. 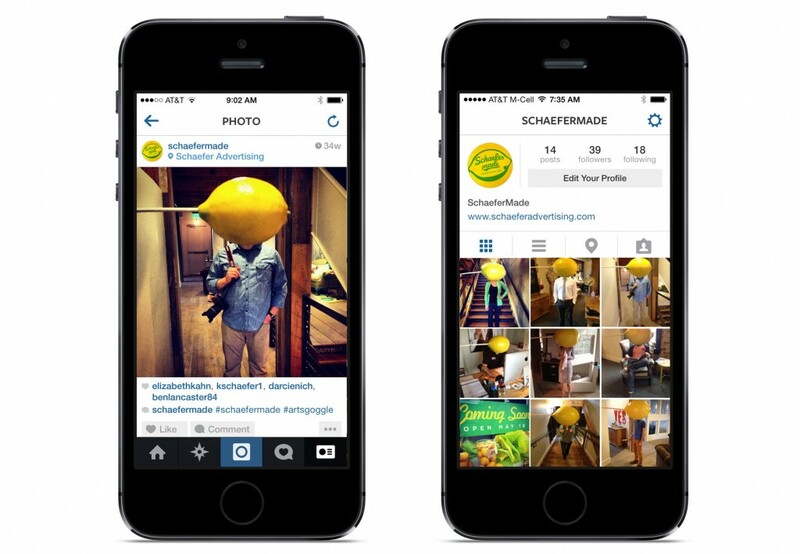 – Art director Charlie Howlett put a lemon on a skewer so he could hold it over people’s faces and take LemonHead portraits of everyone in the office, which he then posted to the Schaefermade Instagram page. – The lemon on the skewer led to some impromptu side yard antics, which we filmed and posted on Facebook. – Obviously, our lemonade stand needed a mascot. Just as obvious to us, that mascot was going to be Account Supervisor Nick Bendian. We ordered the costume, then filmed Nick dancing around and in the middle of Magnolia to make another teaser video, which we also posted on Facebook. 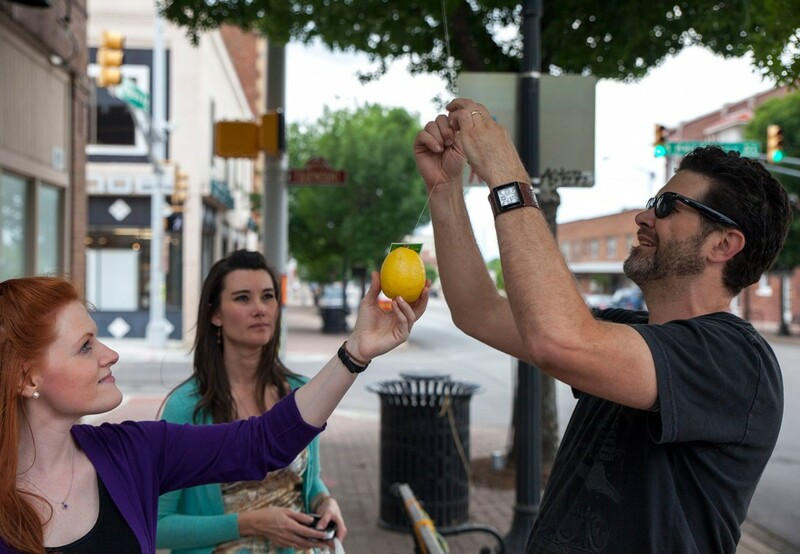 – The Schaefer team hung lemons from trees up and down Magnolia Street. A tag on these lemons teased our upcoming lemonade stand and directed people to tag a photo of the lemon on Instagram. For every photo tagged, Schaefer donated $1 to the tree-planting initiative. 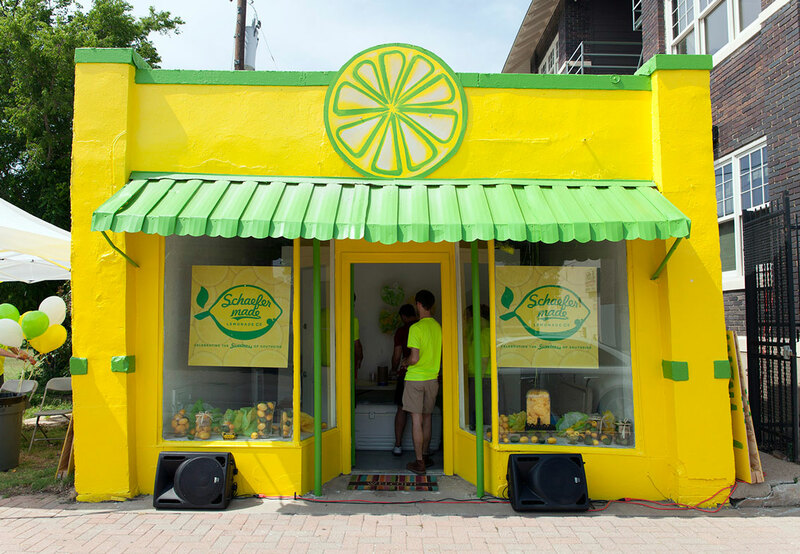 – We created window displays the week before the event to tease the lemonade stand. – And last but not least, we had the building painted bright yellow the day before the event. 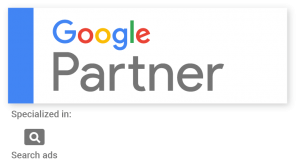 People couldn’t believe we went to all that trouble for a one-day event, and we took it as a compliment. To us, doing things the right way is always worth the effort. Our lemonade stand was a big success. In fact, we ran out of cups long before the event shut down. (Sorry if you didn’t get any lemonade!) Nick danced his heart out for about four hours, losing several pounds of water weight, getting lots of smiles and even posing for a few photos. A good time was had by all.